Ants are ‘social insects’ making up any of nearly 22,000 species within the family ‘Formicidae.’ Ants are both pesky and hard to get rid of in the house and, at the same time are truly amazing creatures. This page will give only the briefest of overviews of Formicidae, mainly touching on points that are important to know when dealing with an ant infestation. For anyone interested in learning about a truly unique creature, we highly suggest a reading of ‘The Superorganism: The Beauty, Elegance, and Strangeness of Insect Societies’. With an estimated 1,000 to 10,000 trillion (one to ten quadrillion) of them around the world, ants are by far the most common species on the planet. Most ants are not able to survive on their own, but in a colony, they become a very strong, capable, adaptable, and hard to get rid of unit. Ants thrive in colonies in which every member in the colony has a role. A handful of ants are tasked with reproducing while others are tasked with, depending on the species, everything from construction, to raising larvae, hunting, building, and even farming other insects. Ants’ methods of survival and gathering food are extremely diverse. Ants are widely different in appearance, ranging in size from less than three hundredths of an inch to two and a half inches and in color from red and black to brown, grey, and even green. All ants, however, have a number of defining features. All ants have a head with two antennae and compound eyes (though some ants are nearly blind) and six legs attached to their thorax. Most queens in a colony have wings. Even within a colony, the difference between ants can be significant. The ant life cycle has four stages – egg, larvae, pupae, and adult. Ants communicate through many methods, the primary being through the release of pheromones. For instance, a crushed ant releases a pheromone that causes nearby ants to go into a frenzied ‘attack mode.’ An ant that finds food releases a trail of pheromones on its way back to the colony. 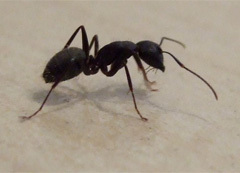 This signals to other ants that there is a food source and signals to them to follow the pheromone trail to the food source. Most people will never see the vast majority of ant species that exist around the world and, indeed, over half the estimated existing species of ants have not yet even been discovered. The species of ants that are most widely seen by people are, not coincidentally, the ones considered to be pests. These ants include, but are not limited to, the pavement ant (the most common household pest ant), sugar ants, fire ants, and carpenter ants. Due to the resilience and adaptability of ants, getting rid of colonies can be extremely difficult.